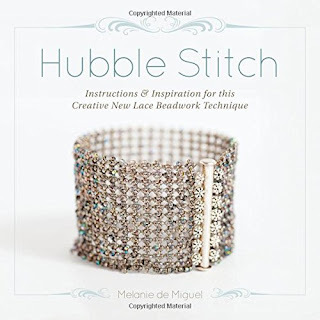 Here is Melanie de Miguel's second book on the hubble stitch! The first, Let's Hubble: A Journey into the Brand New Beadwork Stitch, came out last year. 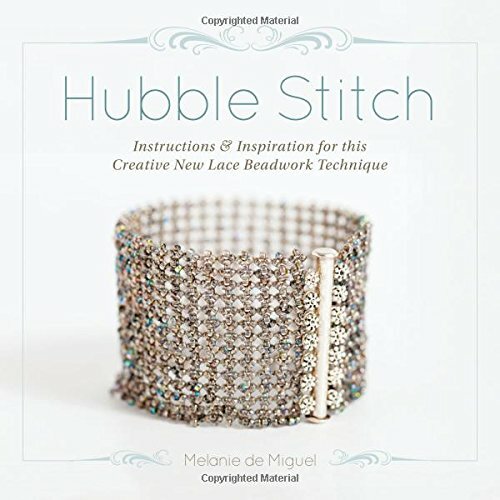 This new volume, Hubble Stitch: Instructions and Inspiration, will give you a chance to truly perfect your understanding of the stitch through projects that are divided by technique. When a new stitch is introduced, it doesn't really deserve to be called a true stitch until there is a complete body of techniques to go with it. Hubble fulfills that requirement: it can be done flat or in the round, it can be increased and decreased, inverted, and turned into 2-drop and 3-drop versions. It can also be expanded (or "spaced out") horizontally and/or vertically. Twelve projects take you through all these techniques. You will be thoroughly versed in the lexicon of Hubble Stitch by the time you work your way through. This is an Interweave book, so you know that the illustrations and instructions are excellent. I really like the possibilities for bezeling and for constructing ropes using the Hubble Stitch. So, if you're ready for a new stitch and a new challenge, I highly recommend this book to get you started!